Preheat oven to 200° and grease a baking tray with Spray and Cook (spray oil). Toast spices in a dry frypan over a medium heat for 1-2 minutes until fragrant. pound the spices in a mortar and pestle until finely ground. Set aside. Return pan to medium heat. Cook onion and pancetta for 5 minutes or until onion softens, stirring. Stir in spices and set aside. 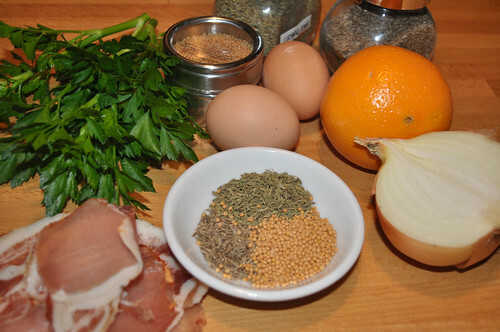 In a large bowl combine the pork, crumbs, parsley, zest, half the egg and onion mixture. Season and mix well. This can be refrigerated until needed. Cut each sheet of puff pastry into thirds, leaving the plastic on. Shape the pork mixture into a sausage down the centre of each strip, roll each strip into a sausage roll using the plastic to help form the shape, use a little cold water to seal the seam. 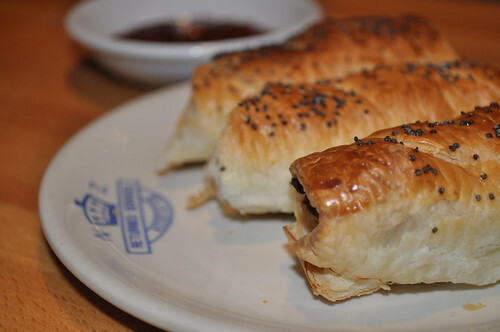 Place the sausage rolls on the greased baking tray, brush with the remaining egg, and sprinkle with poppyseeds. Bake for 20-25 minutes until golden and cooked. While hot slice each roll into thirds and serve with chutney or relish.